Next time you fly, choose AirAsia and get access to a wide variety of Asian, international, and vegetarian fares. You can take your pick from cookies and sandwiches to a selection of AirAsia hot meals that are certified as halal. “We are the only domestic airline company that serves halal food. This is our way of showing we respect culture,” said AirAsia Philippines chief executive officer Joy Cañeba. “For a good flight, we need good food,” she also said. 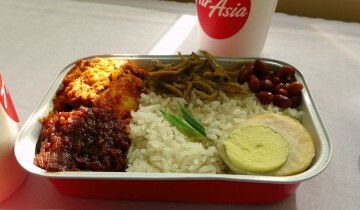 AirAsia’s selection of hot meals include Uncle Chin’s Chicken Rice, Beef Caldereta, and Pak Nasser’s Nasi Lemak. The chicken rice is a Chinese Malaysian favorite of rice cooked in chicken broth and served with roast chicken. It comes with Uncle Chin’s special chili, ginger, and garlic sauce. Another hot meal available on board local and international AirAsia flights is the beef caldereta. This is a Philippine dish made up of beef cooked in tomato sauce and paste mixed with a blend of garlic, bell pepper, onion, and peppercorn. A Malaysian favorite, the Nassi Lemak, is fragrant coconut rice served with tender chicken rendang and special chili plus the traditional condiments of fried anchovies, crunchy groundnuts, and hard-boiled egg. For short flights lasting less than 75 minutes, you need to book your choice of hot meal in advance. Ordering early or at least 24 hours before your flight gets you a 20 percent discount on the meal, which is priced at P200. Pre-booked meals come with bottled mineral water. Two other hot meals – Korean beef steak and honey-glazed soy chicken – are available only for Korea and China flights, at P230 each. AirAsia also serves chicken caesar and kani sandwiches, desserts, chips, cup noodles, coffee, soda, and even wine. The chicken caesar sandwich is grilled chicken breast fillet that captures the American taste. AirAsia food and drink offerings other than the hot meals may be ordered while already on board, according to Cañeba. AirAsia Philippines, in coordination with Azia Suites in Cebu City, invited bloggers to a food-tasting event of its inflight offerings earlier this week.